The Dolphins signed running back Knowshon Moreno, who immediately steps in as the starter. It’s not an ideal situation in Miami for any running back and one you should probably steer clear in 2014. The Titans signed outside linebacker Shaun Phillips to rush the passer in Tennessee. Phillips is not a long-term dynasty solution but has product almost 20 sacks over the last two years. The Eagles signed quarterback Mark Sanchez to back up incumbent Nick Foles. The move doesn’t do anything for Sanchez’s dynasty value but does question Matt Barkley’s. It’s not time to give up on Barkley yet but coach Chip Kelly is certainly not making it easy. The Packers are preparing to break out receiver Jarrett Boykin as a replacement to James Jones. He’ll be a hot dynasty commodity heading in to 2014. In a small upset, defensive end Jared Allen signed with the Bears. He’s nowhere near the top IDP lineman, as he was a few years ago, but should still be a probably double-digit sack candidate. The Bears also signed Lamarr Houston to draw most of the attention on the line which should free Allen up. Rams coach Jeff Fisher expects running back Zac Stacy to get 70% of the carries in St. Louis. That’s welcome news to Stacy dynasty owners and should make Stacy a low-end RB1/high-end RB2 option for a few years. Giants coach Tom Coughlin still has to solve his tight end question, leaving Adrien Robinson’s dynasty potential flapping in the wind. Look for New York to draft a tight end at some point. Coughlin also added he sees new running back Rashad Jennings as an every-down back. Jennings’ stock will never be higher and might be an asset to trade in dynasty leagues for win-now teams. In other workhorse back news, new Bucs coach Lovie Smith confirmed Doug Martin is his man. Martin will be in-line for RB1 running back duties in dynasty leagues this year. The Raiders are expecting big things from newly acquired Matt Schaub this season. Dynasty owners shouldn’t. Unless they draft Sammy Watkins to take some of the load off, Schaub is not a solution. The Jets signed quarterback Mike Vick to compete with second-year quarterback Geno Smith. The Jets have made some moves in the passing game during free agency and Vick could still provide some value. Geno’s dynasty stock does take a dip. receiver Marquess Wilson will get the first chance to be the third receiver in Chicago. It’s a sizable position to be in after Alshon Jeffery and Brandon Marshall. Expect Wilson’s dynasty value to soar leading up to the 2014 season. Also in Bears news, expect linebacker Jon Bostic to move outside in 2014. The move will dampen his dynasty value. Meanwhile, former defensive end Shea McClellin will move to linebacker which should improve his dynasty value after some potential at end. The Steelers signed receiver Lance Moore. Markus Wheaton dynasty owners shouldn’t worry as Moore isn’t expected to challenge his dynasty value. Currently, Moore looks like he was signed for depth. Confirming what was widely expected, the Lions intend to use running back Joique Bell more this season, as opposed to Reggie Bush. Bell is, arguably, the better runner while Bush offers more in the passing game. Both of their dynasty values will be limited unless the other gets injured and shouldn’t be projected as anything more than RB3. Chargers general manager Tom Telesco re-affirmed Ryan Mathews as their workhorse running back. Mathews finally cashed in on his dynasty potential last year and is one of the few full-time running backs left in fantasy football. He’s an ideal RB2 in dynasty leagues for 2014 and beyond. The Texans signed quarterback Ryan Fitzpatrick. This indicates two things: 1) the Texans are likely taking a quarterback with the first overall pick (as opposed to signing a better, win-now option like Mike Vick) and 2) Fitzpatrick should see some playing time early on in the season. If you end up with the Texans quarterback of the future, be sure to snap Fitzpatrick in your dynasty leagues. It also means the end of the Matt Schaub-era in Houston. In other backup quarterback news, Jason Campbell signed with the Bengals to back up Andy Dalton. There were calls at the end of last season for the Bengals to do something about Dalton and signing Campbell won’t change that. Campbell is one of the better back ups in the league and is surrounded by talent in Cincinnati. It’s a serious question if Dalton is their long-term plan at quarterback or not. The Panthers recently signed Jerricho Cotchery to be their top receiving option. You have to assume the Panthers have a plan at receiver after missing on every option before Cotchery while cutting veteran Steve Smith. Luckily, there are a ton of receivers in this years draft. Panthers quarterback Cam Newton will have ankle surgery but should be ready for training camp. If there was ever a time to buy-low on Newton, it’s now. Wide receiver Andrew Hawkins officially signed with Cleveland where he’ll be the new slot receiver. Between his signing, and the arrival of Ben Tate, the Browns offense is shaping up to be a very supportive cast for whoever ends up as the quarterback in 2014 and beyond. The Giants signed receiver Mario Manningham, who will be no better than fourth on the depth chart. Now that the Patriots have re-signed Julian Edelman and added Brandon LaFell, the fifth spot on the depth chart will be between Kenbrell Thompkins and Josh Boyce. Both had some dynasty appeal heading in to last year but it turned out to be inflated. Neither are expected to hit it big this year. Click here for complete dynasty tight end rankings, now with Rotoworld rankings included. Top six remains the same with Jimmy Graham, Rob Gronkowski, Julius Thomas, Jordan Cameron, Vernon Davis and Jordan Reed at the top. 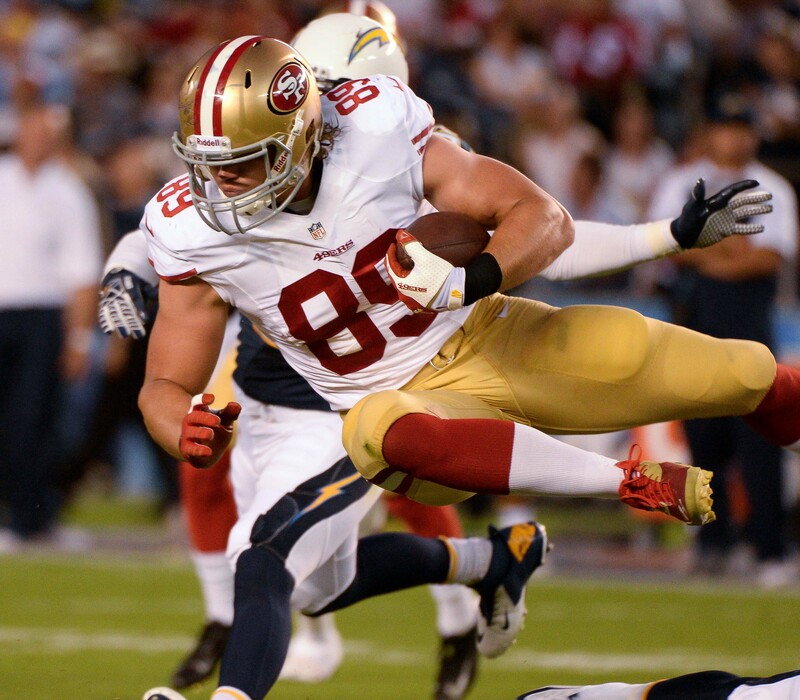 Big risers this update include Vance McDonald of the 49ers. Vernon Davis is now 30 years old and McDonald is the current candidate to replace him; same goes for McDonald’s Rice teammate Luke Willson in Seattle, playing behind now-28-year-old Zach Miller; the last big riser is Atlanta’s Levine Toilolo. With Tony Gonzalez’ retirement (almost) official, Toilolo steps in as the starter in a high-powered offense. The big drops this update include the previously mentioned Miller; the Eagles Brent Celek, 29, who will be giving more snaps to Zach Ertz; the other big drop includes Jacksonville’s Marcedes Lewis, who could be a decent buy-low candidate if Jacksonville draft’s a quarterback in May. The new entries to the rankings include Houston’s Ryan Griffin, who immediately looks appealing thanks to Owen Daniels’ release; and the Giants Adrien Robinson who is currently the starter in New York thanks to Brandon Myers signing in Tampa.